"Although [Milt] Jackson has only rarely been identified with those who treat soul as one of our more readily marketable commodities, he is widely recognized as possessing that intangible in abundance." 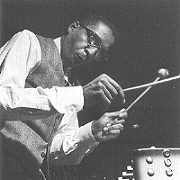 Born in Detroit, vibraphonist Milt Jackson began playing guitar at the age of seven and piano at the age of 11 before taking up xylophone and vibraphone in his teens. He first performed in public as a member of a touring gospel quartet, in which he sang tenor. In 1945 he was part of a local jazz group that played with Dizzy Gillespie in a concert in Detroit. Shortly afterwards Gillespie engaged Jackson for his New York sextet and later for his big band of 1946. In 1948-49 Jackson worked with Howard McGhee, Thelonious Monk, Charlie Parker, Woody Herman, and others. He returned to Gillespie from 1950-52, at the same time issuing some recordings under the name of the Milt Jackson Quartet with musicians like Lou Donaldson, Horace Silver, and Ray Brown. By the end of 1952 the group's lineup had stabilized with John Lewis on piano, Percy Heath on bass, and Connie Kay on drums, and was renamed the Modern Jazz Quartet. Jackson's career centered on the MJQ for more than 20 years; only in the summer months when the MJQ did not perform did he regularly take on other jazz engagements as a leader or sideman. In 1974, frustrated over his economic position after his many years with the MJQ, Jackson triggered the dissolution of the group. He then toured alone, performing with local bands in various cities. Thereafter he has organized and performed with a number of small combos, but has rejoined his colleagues in the MJQ for annual concert tours. Jackson was one of the first vibraphonists to master the bop style, and is generally regarded as one of the finest performers on his instrument in the history of jazz. His improvisations exhibit great rhythmic variety, with sudden outbursts of short notes often adjoining languid, sustained phrases. He also utilizes a wide range of dynamics to highly expressive ends. His great control of rhythm and dynamics is clearest in his masterly improvisations at slow tempos, but he also has an affinity for the 12-bar blues, and has recorded many excellent blues solos. He was one of the first vibraphonists to slow the speed of the instrument's oscillator to about 3.3 revolutions per second (as opposed to Lionel Hampton's vibrato spped of about 10 per second), thus warming his long notes with a subtle vibrato and avoiding the nervous shimmy on shorter notes that is heard in the work of earlier vibraphonists. Jackson has also written a number of well-known jazz tunes, such as "Bluesology," "Bags' Groove," "The Cylinder," and "Ralph's New Blues," whose simple pentatonicism and formal design often contrast sharply with the complexity of his improvisations. A selected discography of Milt Jackson albums. In The Beginning, 1948, Galaxy. Milt Jackson, 1948-52, Blue Note. The First Q, 1951-52, Savoy. Milt Jackson Quartet, 1955, Prestige. Bags and Trane, 1959, Atlantic. The Big 3, 1975, Pablo.